So, it's no Chewbacca Mom—what is?—but the first fan-generated ad has landed for the megamillion-dollar toy line around Rogue One: A Star Wars Story, one of the most anticipated films of the year. 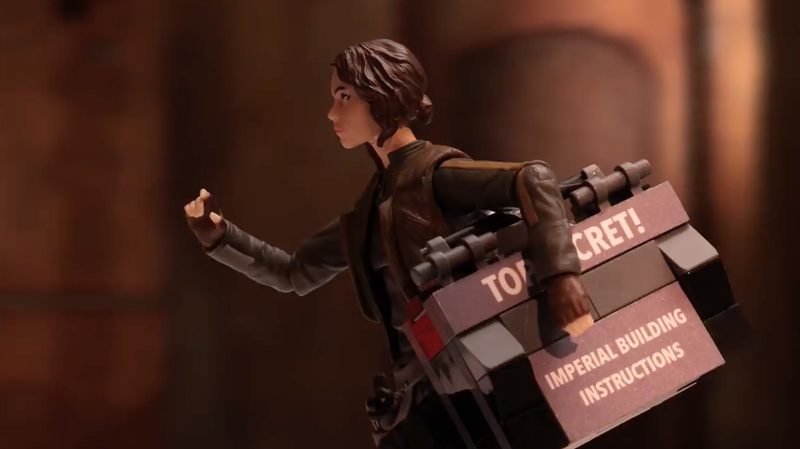 It's a fairly epic video, done in stop-motion animation, that includes a sneak peek at a whole toy box of products from Lego, Funko, Hasbro and others. (Bobbleheads, construction toys and other swag had been under wraps until now—it all goes on sale this fall). The two-minute video stars Rogue One's lead character, Jyn Erso, who will be played by Felicity Jones, a possible nod to all the fans upset that female hero Rey was largely absent from toy sets and their advertising for Star Wars: The Force Awakens. (Remember #WhereIsRey?) Erso even gets in a dig at the expense of a few pocket-sized Stormtroopers. The spot, dubbed "Go Rogue: Chapter 1," in addition to being sharp and fun, has some creative gravitas behind it. Directors Tucker Barrie and Dan MacKenzie worked on Charlie Kaufman's Academy Award-nominated film Anomalisa. It launched last week on the Star Wars YouTube channel and comes via a collaboration between Disney's Lucasfilm and creative network Tongal. It also kicks off a broader global competition that asks fans to share their "rogue stories" and potentially win a trip to Rogue One's December premiere at the Lucasfilm headquarters at the Presidio in San Francisco. Expect several more consumer-created shorts, packed with Mattel, Disney Store and Jakks Pacific products, in the next month. Fans can pre-order based on the content, with Disney no doubt looking to beat its $700 million take from The Force Awakens toys.